Welcome to the AVG Antivirus complaints department brought to you by HissingKitty. Experienced poor customer service? We make it easy to file a formal complaint against AVG Antivirus online. Simply use our free form and your feedback will be instantly forwarded for review. Need to contact the AVG Antivirus corporate office? We have the mailing address, phone number, and email address listed below. Advise everyone to contact the Attorney Generals office and Better Business Bureau... total scam... purchased from store 2 weeks ago and today AVG shut off and sent a crazy message. How the hell does an antivirus shut itself off. Call tech support and they want to charge me $79 plus $129 if there is a problem with my computer. SCAM... I will go back to Norton but am filing a formal complaint. I went download the program and got notice to call tech support. The tech told themme that I have a lot of malware and other issues that's why it would not download. I gave him the key number for ccleaner to fix the issues and he told me that he would have to turn it over to another tech and it would not cost me any money then when I told him go head and have the tech download and run the program to fix the issues, I was told that it would cost me $150.00. I said I wasn't paying extra for it when I already paid for it. I told him that ok download the cleaner and I would perform the cleaner myself and this is when he told me that the cleaner could not be downloaded and ran because of the same problem with downloading Ultimate. I was on the phone for over 2 hours. I have previous versions of AVG SOFTWARE. I feel like I wasted $50.00 on something I cannot use. I bought it from Walmart. I am going to buy NORTON security software now. Used to run AVG free with no problems. But thought that it was better to upgrade so spent £34-99. What did I get? Nothing only a lot of "hassle" when I phoned to ask why my computer was still running only the free version. Was told it would cost even more to run higher version. So beware AVG is a waste of money. 39.99 fee was taken out of my checking account plus a $29.00 Overdraft Fee, plus a $2.00 International fee for which I did not authorize. Spoke with a foreign rep (male) last week after calling the AVG customer service number who took all of my information about getting my funds put back into my bank account. Today (2/24/16) AVG went ahead and put the charge through, overdrawing my checking account, causing hardship to my family (medications, etc for husband) who is disabled. I will be contacting the BBB, my bank and attorney. These thieves need to be put out of business. Why has someone taken money out of my bank and payed for the AVG antivirus when i never gave permission to. Now you made me short of money. Next time ask if I want it before scamming me. Where is the AVG complaint line? I need to report this so I can get a refund immediately. Sorry for the complaint about AVG, but I think this company is a total scam. Every time it has been suggested that I use AVG, it is because my computer gets infected in some way. Crazy huh? What a coincicdence that my computer gets a virus then AVG is there to "clean up" my problems with their anti-virus software. Best anti-virus software I have come across is AVG Antivirus. It accurately distinguishes between safe and dangerous files. It uses layers of protection. The first layer is traditional antivirus, which recognizes threats by matching them to a database of known threats. I have AVG currently installed on my desktop. I have not had any problems. No viruses or malware. I trust AVG more than any other software. owes not bog down your system like others with too many bells and whistles. 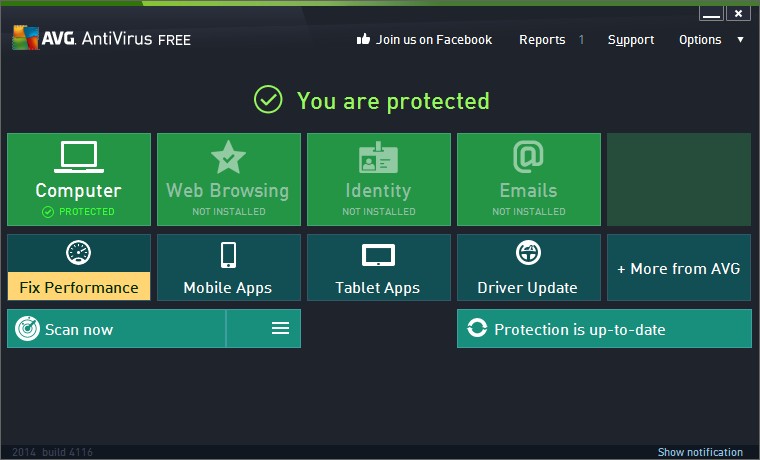 Have feedback for AVG Antivirus?